When was the last time you played in the dirt? When was the last time you got muddy? When was the last time you let your inner child out to play? Do your kids constantly ask you to do things with them? Sometimes we get caught up in our daily routines and all the stuff on our to do list. Those things tend to start seeming more important than they really are. Then as parents we sometimes relay on screens to occupy our kids while we attend to these to do's. I recognize I've been doing way too much of that lately and tasked my boys to spend today playing without screens. Dylan and Aidan busy building their beach. My boys came up with this fun project all on their own today for their outdoors fun. They decided to build a beach and other than the sand, which believe it or not we had to purchase because we couldn't find actual sand anywhere, they made their beach out of found objects and stuff from our craft cupboard. They made a beach then created a fire pit with sticks, built a tent from twigs tied together with string and some fabric strips as the tarp, floated leaves for ships and even used bath fizzies for icebergs. They were so excited to work together and had so many ideas. I wanted to remind them that there is a world beyond video games and although they'll continue to pester me about screen time today, I love seeing them play and be creative outdoors. Scavenger Hunt: Get a paper bag for each participant and list the items for the hunt. Leave a box to check off for each item collected. After your hunt have the kids make a collage of their treasures on a poster board. Diorama: Get a box, dream up a theme. Collect found items around the house, the yard, from a hike, etc. You can print graphics from a great web site like Twisty Noodle to color and add to your display. Tissue paper makes great clouds and water and even the sun. 3. Create a fairy garden: using stones, sticks, buttons, gems, anything that you and your child think the fairies would like, create a little area in your garden dedicated to the little folk. 4. Safari Scrapbook: Pick up a few disposable cameras or bring your own cameras and head out for a hike. Take photos of flora and fauna on your hike and put together a scrap book when you get home. 5. 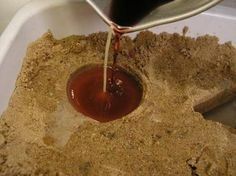 Sand Candles: Find yourself some sand and dig some holes the sand will be the outside of your candle so get creative with the shape and depth of the hole. Cut a length of wick, or some cotton string to reach the bottom of your hole. Tie the top of the string or wick around a pencil or stick which will stretch across the top of the hole holding it in place. Melt wax or even a bunch of old crayons and pour them into your hole. Let sit until it's completely cool and solid then dig out your candles. The point is, there are millions of things to do out there so when your kid says, "I'm bored", or, "Can I play some video games?" Dig up some creativity and some craft supplies, take a hike and see what you can come up with. Your kids will have a blast and you will too and more importantly, you will all remember what is really important in life, being with family and being a kid while you still can.